New York City – October 18, 2013: At this year's Audio Engineering Society Convention, premium audio brand Neumann [booth 2831] announced its newest studio microphone: The TLM 107 large diaphragm microphone. It stands for innovation based on tradition and is a universal, standard-setting microphone with multiple polar patterns for studio, broadcasting and demanding home recording applications. The TLM 107 features a surprisingly fresh design and a novel operating concept. Wolfgang Fraissinet, President of Neumann.Berlin, explains: "The TLM 107 is a modern, high-resolution sound transducer with excellent reproduction characteristics that enable it to capture the original sound without any coloration, thus ensuring unlimited design freedom in mixing and post-production." For the first time, all of the microphone switch functions are controlled through an elegant, wear-resistant navigation switch. The contemporary, intuitive operating concept includes an illuminated pattern display in the chrome ring, with the Pad and Low Cut status LEDs positioned to the left and right. The switch and display are located on the rear of the microphone so as to not distract singers. After 15 seconds, the display is turned off automatically, allowing the TLM 107 to be positioned discretely on the stage. The newly developed double diaphragm capsule is inspired by one of Neumann's top models, the D-01. With its exceptional impulse fidelity, the TLM 107 is particularly suitable for percussion and the finest overtones of stringed instruments. As a multi-pattern microphone made by Neumann.Berlin, the TLM 107 is impressive not only in the cardioid setting, but delivers balanced sound for all five directional characteristics: Omnidirectional, cardioid and figure-8, with the intermediate patterns wide-angle cardioid and hypercardioid. For all polar patterns, up to 8 kHz the sound reproduction is almost linear, while a slight high frequency boost lends brilliance and freshness to recordings. Particular attention has been paid to the natural reproduction of the human voice, especially the critical "s" sound. Low sensitivity to pop sounds is ensured by an acoustically optimized grille, which has a characteristic Neumann design, with youthful, flowing lines. The capsule is designed to minimize sensitivity to humidity and other environmental influences. For example, the front and rear diaphragms are at ground voltage, thus preventing the electrostatic attraction of dust particles. In order to ensure that no dust enters the interior, the sound transducer — like all Neumann capsules — is mounted in one of the best cleanrooms in Germany. Transformerless circuitry permits a high degree of linearity and a large dynamic range. The self-noise of only 10 dB-A is practically inaudible. The maximum sound pressure level, specified as 141 dB SPL, can be increased to 153 dB SPL via the two-stage pre-attenuation, so that sound from even the loudest sources can be transmitted without distortion. The switchable Low Cut with the settings Linear, 40 Hz and 100 Hz has been carefully adapted to practical recording situations: The 40 Hz setting eliminates interference noise below the range of fundamental tones, while the 100 Hz setting is ideally suited to speech and vocal recordings. The TLM 107, which is priced at $1,699.95 and available in late November, is supplied in the colors matte nickel or black, and includes a stand mount. 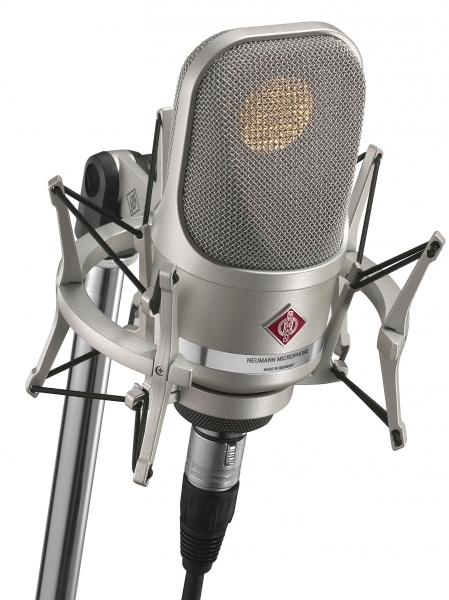 Detailed product information can be found at www.tlm107.neumann.com.